Home / Computer / What Is A Project? Question: What is a Projector? Answer: A projector is also an output device. With the help of a project; we can display information on a larger screen. The information may be printed on the paper or it may be an output of the computer. Usually, the output of the computer is display on the larger screen. Projectors are available in different resolution and sizes which are enough to display a cricket match on a bigger banner. 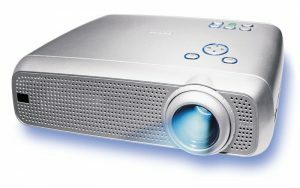 Projectors are also being used in classrooms to display the lecture on the bigger white screen so that all the class can easily read and watch the result.